My level of excitement about this sweater is probably a little strange and slightly embarrassing, but after only completing my first sweater this past winter, I'm so happy my attempt at modification didn't end up a complete disaster. Instead, I see myself wearing this thing ALL the time this winter when it gets cold (and not a day like yesterday when it was 70-something degrees out - hence the shorts). The first thing I want to say is how much I loved this pattern. It was incredibly easy to follow but the cables make it look complicated. It kept my attention the whole time and the fact that I was able to modify it successfully means to me that it is great for everyone of every size and every style. Of course, I could have just looked at the over 600 projects on ravelry to figure that out. 2. Knit the sleeves using the size XS. I feel like it's a little too loose around my upper arms. 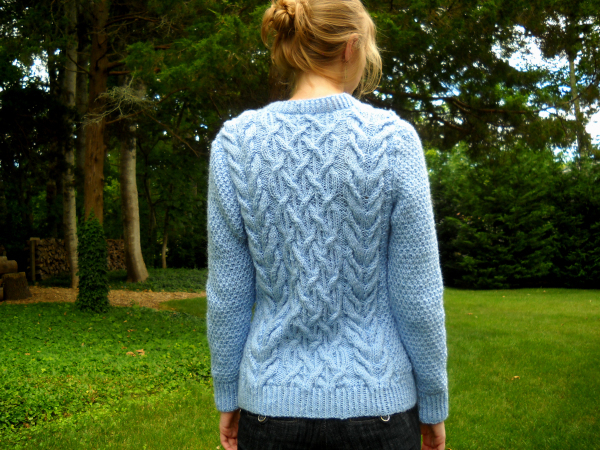 I took copious notes throughout the process of knitting this, especially as I think I would like to do this again with another pullover sweater pattern. 1. I knit the back exactly as written. 2. I lengthened the sleeves to make them full length. I knit them both at once on the same needles as I knew I would probably suffer from the 'second-sleeve syndrome.' (I've only heard this applied as the 'second-sock syndrome,' but I think it works just fine here as well). I also knit the sleeves after I knit the back and before I knit the front. I really hate knitting sleeves so I knew I better not save them for last. - Work 12 stitches in moss stitch, place marker. Work Row 1 of Chart A, Place marker. Work Row 1 of 4-strand cable. C4F: Slip two stitches onto cable needle and hold in front of work, knit two, knit two from cable needle. C4B: Slip two stitches onto cable needle and hold in back of work, knit two, knit two from cable needle. C4BKP: Slip two stitches on cable needle and hold in back of work, knit 2, purl two from cable needle. - Work in pattern for back until 15.5 inches from beginning (or however long your selected size says to knit until), only doing waist decreases and increases on the moss-stitch side of the work. DO NOT k2tog or make ANY stitches on the side that will be the center of the cardigan. - Follow pattern for armhold shaping. - For neck shaping, follow pattern until last four stitches, k2tog, k2 on right side. On wrong side, P2, P2tog. - Continue with neck decreases until there are 26 stitches left on the needle. 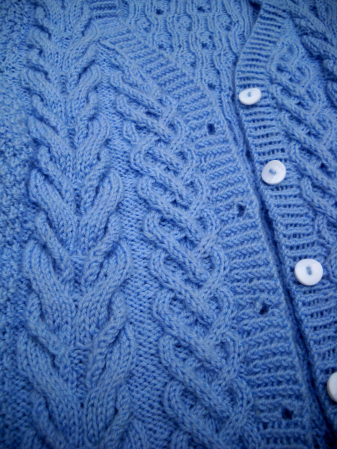 From there, follow JUST the shoulder bind off direction from the pattern for the BACK. Don't go past where it says you have to break the yarn. That is the shaping for the original pullover neckline, which we are NOT doing. - The process is the same as for the left front, except the moss stitch will be done last in the set up row, instead of first. 5. 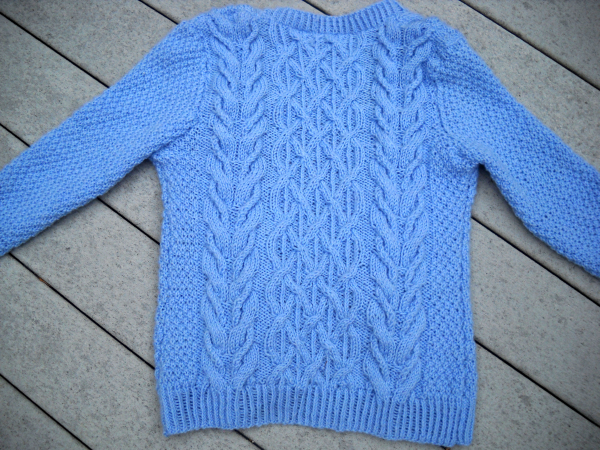 I blocked this sweater quite aggressively, as it was made with an acrylic blend. I also wanted it to be a bit of a slouchy sweater rather than a form-fitting one, and blocked it to a little bit bigger measurements than the pattern gave. - I did not write down what I did to continue the 4-strand pattern through the decreases. I just went with it and you'll notice each side is a little different. My advice is to keep doing as much of the pattern as possible as you start decreasing, and when you're using a cable needle, cross stitches before you bind them off. 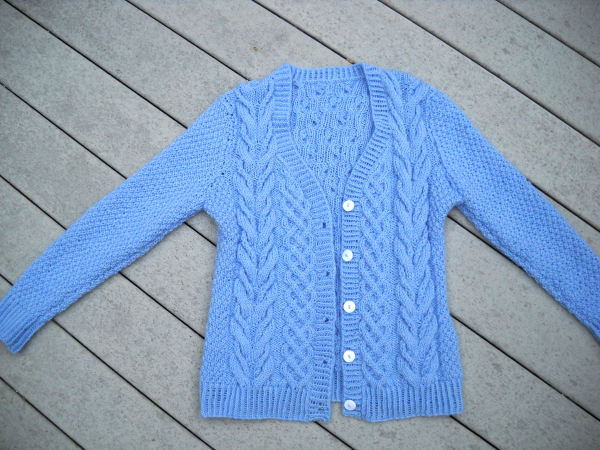 You can see my button band tutorial here. And please, if you have any questions do not be afraid to ask. I hope some of you will try to modify this as well! My directions are for the small size but the moss stitch 'buffer' makes it really easy to add or decrease width. This is so amazing that I'm thinking about frogging mine right now and starting over following your instructions. Seriously, you are a genius for modifying it this way and I wish I had your skills! This sweater is gorgeous! I love the cable work and the color! Thanks so much! And I hope you do try! If you have any questions please let me know. Haha thank you so much! It really was a lot of luck that it worked out! Yours is just as beautiful, though! I don't think yours needs any modification, but if you do let me know of any way I can help. Beautiful finished object! Congratulations on your second sweater! beautiful!! you did a fantastic job on your modification, looks amazing. Thanks so much! 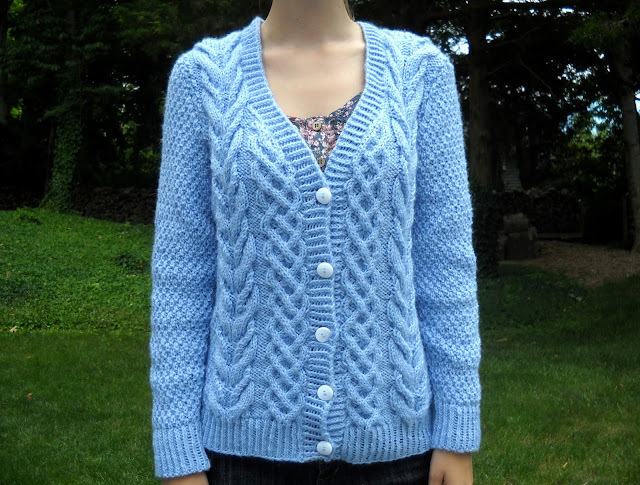 All of the mod mondays of other knitter's modifications on your blog definitely added some inspiration!